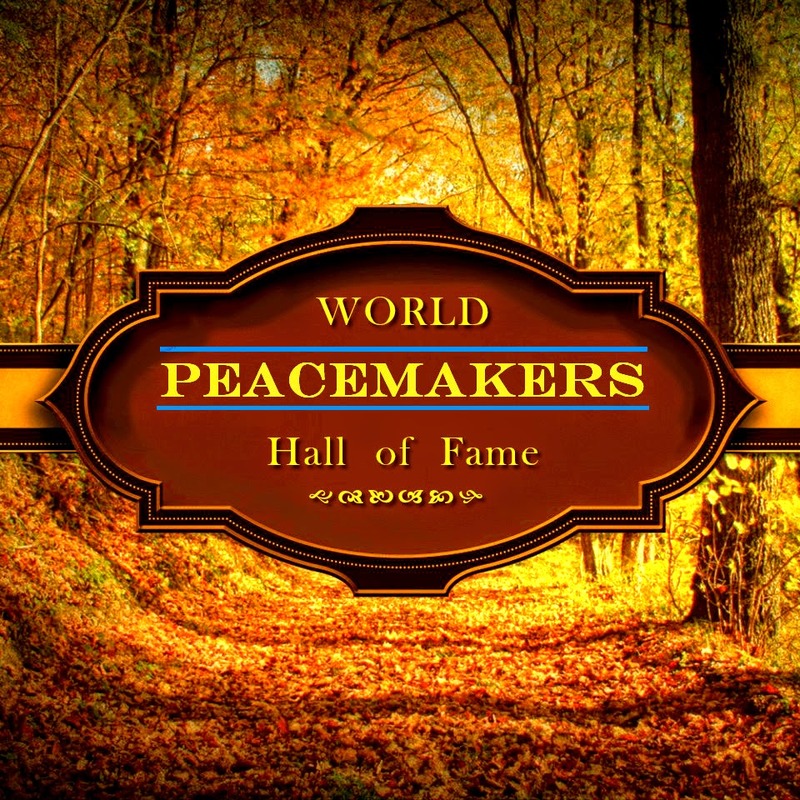 "WORLD PEACEMAKERS HALL OF FAME"
Today, an eloquent voice has been silenced, a beautiful mind stilled, and a bountiful heart stopped. The epic soul of Nelson Mandela is now resting. 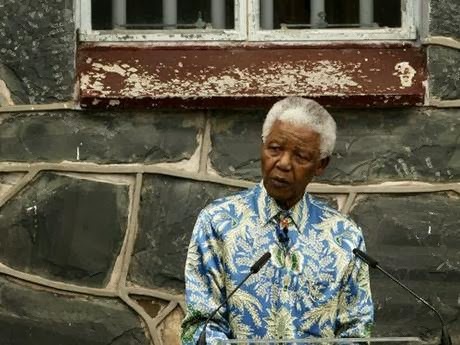 It is routine to suggest that the legacy of a man or woman will outlive that person, but in this case, the world will never be the same now that Nelson Mandela has occupied it. The example of his leadership – from prison to the presidency – from a land riven by fear to a people reconciled through truth and justice – will stand for all time. I remember Nelson Mandela was a man of profound dignity. I had the opportunity to see Nelson Mandela on several occasions when our work at the United Nations coincided. In 2001 Ione Biggs and Renate Jakupca, together as Co-Directors of the 'US Network for the United Nations World Conference Against Racism' a project of the International Center for Environmental Arts (ICEA) made their mark on contemporary history in Durban, South Africa by answering the United Nations’ call to "forge a real sense of vision and common purpose in the struggle for racial harmony and tolerance." 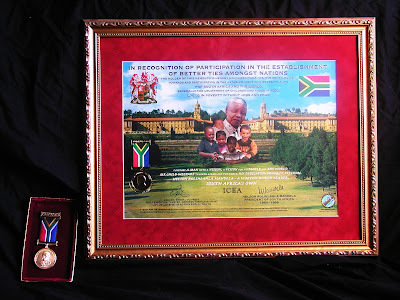 Their courage and vision were publicly recognized when Ione and Renate received from Nelson Mandela his International Gold Medal Leadership Award in Human Rights. My condolences to his family and loved ones and to the people of South Africa and all of the World. Now as we mourn his passing and celebrate his life, we must also find inspiration in his memory – striving daily to promote peace, freedom, and dignity for others.His lessons will live on, and his life's work will continue to inspire us all. Madiba~ Thank you for all you have given. You will not be forgotten. Peace Friend. 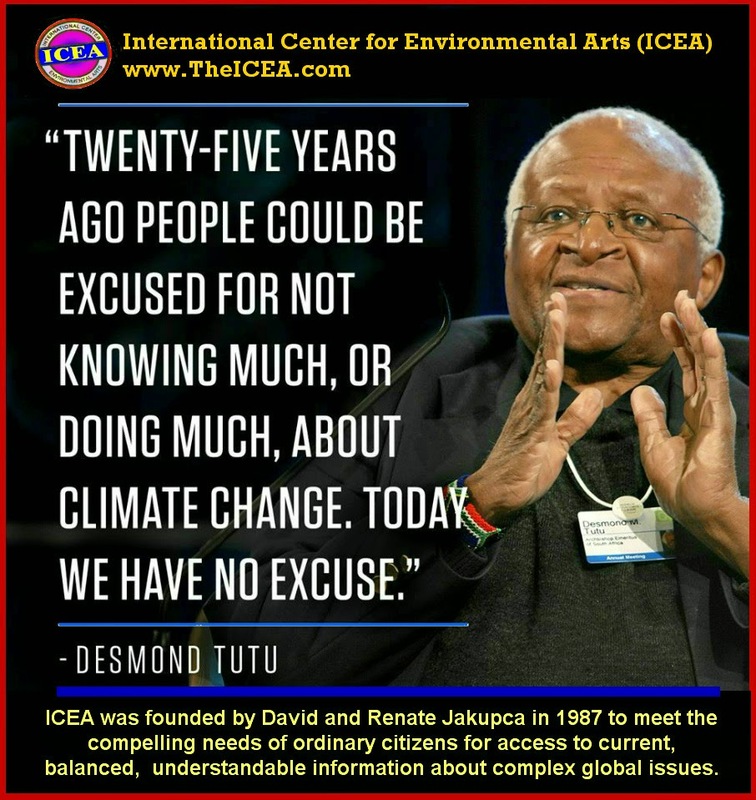 PS~ It is hard to believe that over twenty years ago Desmond Tutu, Mary Robinson, Dalai Lama, Jimmy Cater, Geraldine Ferraro, Boutros Boutros-Ghali and Nelson Mandela.to others from the Elders believed in Cleveland by allowing the American Cultural Ambassadors, Me and David Jakupca of the International center for Environmental Arts (ICEA) to recycle the United Nations Worlds Conferences. 3 SEPTEMBER, 2001: 12:45 P.M.
"As a citizen of the world community, I stand with the United Nations against racism, discrimination and intolerance of any kind. Throughout my life I will try to promote equality, justice and dignity among all people in my home, my community and everywhere in the world". These are the words of the United Nations Personal Pledge Against Racism, launched in December 2000 as part of an international youth art competition to promote the World Conference against Racism. A selection of the drawings, paintings, essays and poems are now on view in a two-part display at the International Conference Centre (ICC) in Durban (ground floor, foyer area) and at the Durban Exhibition Centre (DEC). A group of the youth artists from South Africa and from the United States will be attending the event with Mary Robinson to present her with the "United Nations Pledge Against Racism" on 3 September at the ICC main foyer exhibition site. The pledge and the art competition were organized by the United Nations Department of Public Information in cooperation with the Youth Art Connection / Boys and Girls Clubs of Atlanta in the United States, who worked with over 30 countries in their global youth outreach programme, International Paint Pals. UN Information Centres worldwide also participated, along with Survivors Art Foundation, Totem Rythms, Cheney University in the United States and several non-governmental organizations (NGOs). A special nationwide competition was held throughout South Africa, organized by the UN Information Centre, Pretoria. Former South African President Nelson Mandela handed over the first prize--a bicycle--to Christa Schutz from Glencoe, Kwazulu-Natal, at his home in Houghton on 9 July. Mandela asked Christa to explain the painting and to "tell all the children I love them". Reknowned musician Hugh Masekela was one of the five judges who selected the winning entries for the Durban exhibit. In Atlanta, home of Martin Luther King, Jr., the Youth Art Connection hosted an event to "Stomp Out Racism", where hundreds of children placed their feet in buckets of coloured paint and stepped onto a huge canvas banner, and stomped out the words "racism, hatred, bigotry, prejudice and intolerance". The event was held at the Martin Luther King, Jr. National Historic Site and the banner was carried to the Durban Conference from Atlanta to be part of the art exhibition. Survivors Art Foundation, with students from Cheney University--the oldest historically black university in the United States--also prepared hanging silk paintings for the Durban Conference. Four students from Cheney University came to Durban to help with the creation of a "Tree of Pledges" at the exhibit site in the DEC. Totem Rhythms also created banners and "story poles" with young and elder Native Americans, using indigenous symbols and patterns. Since its launch in December 2000, more than a million people have signed the Pledge Against Racism, which was sent around the world via the Internet, through the UN Information Centres, and through NGOs. 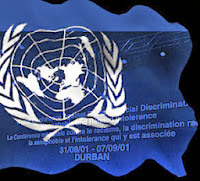 The United Nations Information Centres in India and Bangladesh alone collected over 60,000 signatures; many of these are now incorporated into the Tree of Pledges in Durban. This evening, President Obama delivered a statement on the passing of former South African President and anti-apartheid leader Nelson Mandela. Click here to watch President Obama's statement. The global movement for human rights has lost one of its great figures - Ione Bigg. Cleveland, Ohio - The global movement for human rights has lost one of its great figures. Ione Biggs, a beloved friend and defender of human rights, died Friday, December 16th, 2005 at LakeWest Hospital. She was 89. She was a advocate for social change in the United States, Europe, Africa, Australia and Central America. Ione fought tirelessly for social change. In the 1960s she marched for Mayor Carl B. Stokes and against the Vietnam War. She later worked with Nine Five to advocate for working women. 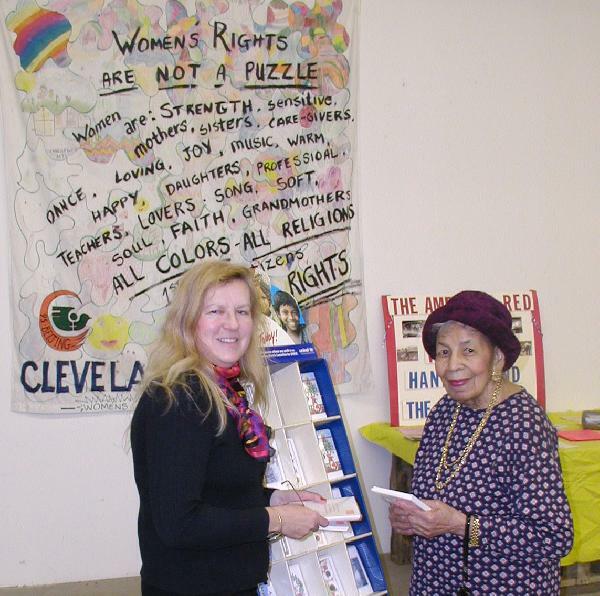 She backed Cleveland Women Working, Speakout for Affirmative Action, League of Women Voters, WomenSpace, American Civil Liberties Union and many other organizations. She attended a peace conference in Sweden. She went to the Soviet Union to support women there who wanted nuclear disarmament. She was an advocate of the principles of the United Nations and attended the 1985 UN World Conference on Women in Nairobi, Kenya. 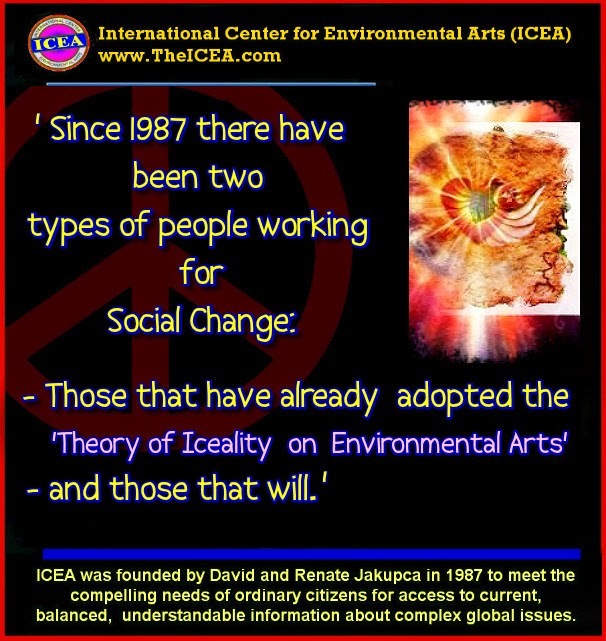 In 1992 Ione became active with the International Center for Environmental Arts (ICEA) in Cleveland, Ohio. She contributed to the World Conference on Human Rights in Vienna, Austria (1993), the Conference on Population and Development in Cairo, Egypt (1994), the Fourth World Conference on Women in Beijing, China (1995), and the Habitat II - Conference on Cities in Istanbul, Turkey (1996), EXPO2000 in Hannover, Germany (2000), World Conference Against Racism in Durban, South Africa (2001) and the World Summit on Sustainable Development in Johannesburg, South Africa (2002). 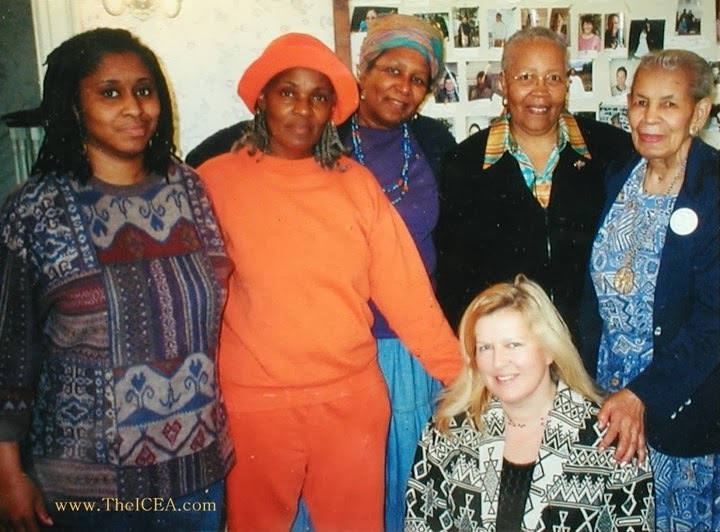 In 2000 Ione became Honorary Chairwomen of the Board of ICEA when the organization was nominated by TIME Magazine in their Millennium Issue as one of their Hero's of the Planet. In 2001 Ione Biggs and Renate Jakupca, together as Co-Directors of the 'US Network for the Conference Against Racism', made their mark on contemporary history in Durban, South Africa by answering the United Nations’ call to "forge a real sense of vision and common purpose in the struggle for racial harmony and tolerance." Their courage and vision were publicly recognized when Ione and Renate received the Nelson Mandela International Gold Medal Leadership Award in Human Rights. Ione and her husband, Keith, were married for 53 years, he died in 2003. Ione is survived by a son, Keith D. Jr., of Euclid, and a daughter, Gladys Morrow of Baltimore. Her Memorial Service was held at 10:30 a.m. Wednesday, Dec 21, 2005 at the Church of the Covenant, 11205 Euclid Ave., Cleveland, Ohio. Friends of Ione filled the large church to its capacity. When a cure was not to be. And whispered, "Ione, Come with me." You fought so hard to stay. She was one of the best! "Mandela taught the world that the very path to freedom and human dignity lies in love, wisdom and compassion." A delegation of Elders is in South Africa today to attend the memorial service of their founder, Nelson Mandela. 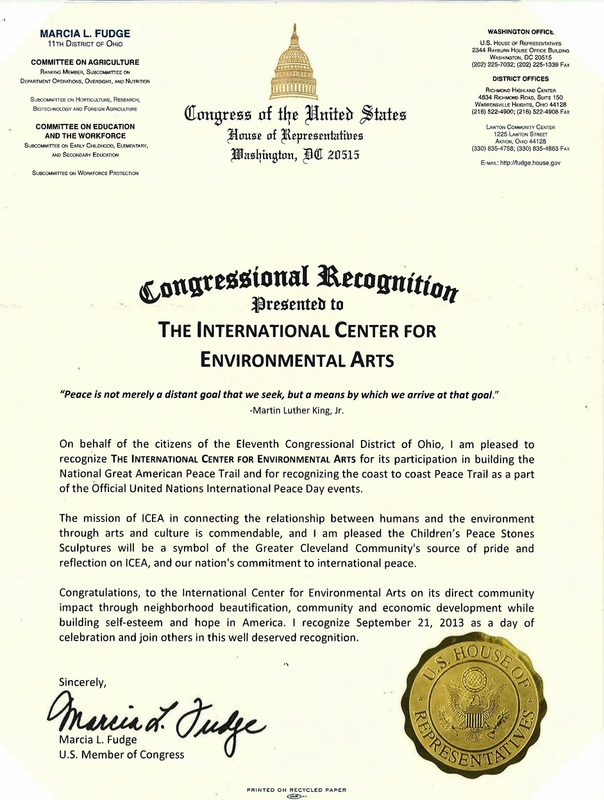 Utilizing the Theory of Iceality on Environmental Arts, the 'Iceality Methodology' was developed to promote the building of the Worlds Children Peace Monument (WCPM) and the Great American Peace Trail. Originally designed for MYSPACE, The 'Iceality Methodology' has been 'borrowed' as a tool for social change by virtually every social activist organization and group on Facebook and is now used by over 1 Billion people in a still growing audience. 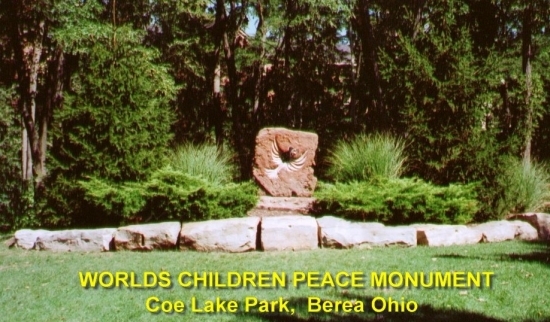 "The Worlds Children Peace Monument (WCPM) and the Great American Peace Trail (GAPT) Projects are international, public participatory art projects designed to engage children with cross-cultural awareness in order to attain the common goal of sharing peace and diversity with their neighbors. The peace projects, utilizing the principles of the 'Theory of Iceality on Environmental Arts' have direct community impact through neighborhood beautification, community and economic development while building self-esteem and hope in America. They will help to build better neighborhoods where everyone can live, respect and accept each other as they diplomatically negotiate errors and differences of prejudice and hatred and instill in its place the belief in the necessity of communication." 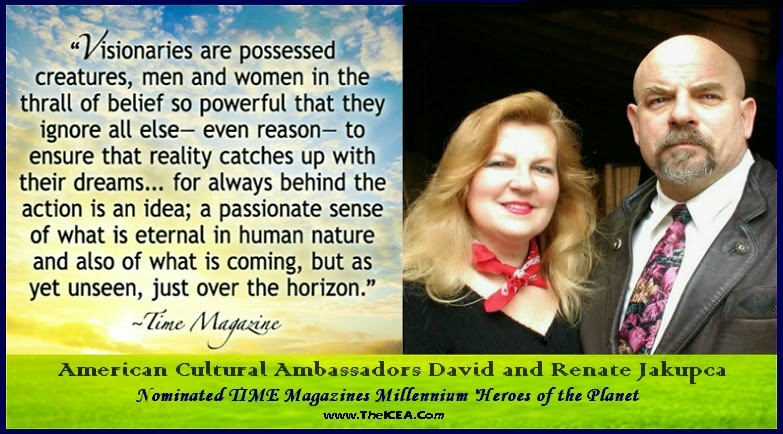 American Cultural Ambassadors David and Renate Jakupca. 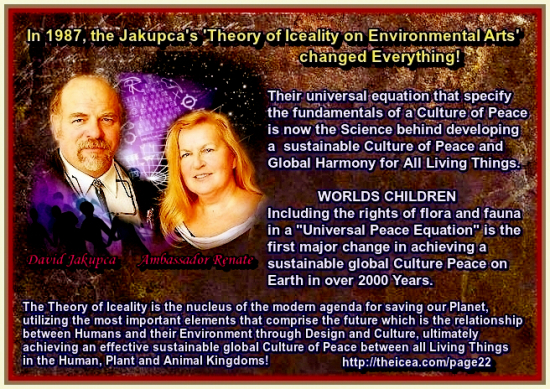 The "Theory on Iceality on Environmental Arts" used in the building of the “Worlds Children Peace Monument (WCPM) is a learning by association formula that builds a concept within and makes the whole greater than the sum of its parts. A form of synergy called the Iceality Method whereby the interaction of multiple elements ( Peace Stones) work together in a culture of peace structured to reproduce in a sustainable effect, in this case the WCPM, that is superior than the sum of their individual Stones. The learning occurs as the Worlds Children using the Iceality Methodology, take part in the education, personal development, schooling and training adding new Peace Stones from the Worlds Children Peace Monument (WCPM) to municipal parks. It is a product of nature, goal-oriented and aided by motivation by concerned personnel. In essence, the WCPM is a system of interrelated international components working together with a common objective: Creating a Sustainable Global Culture of Peace for All Living Things! 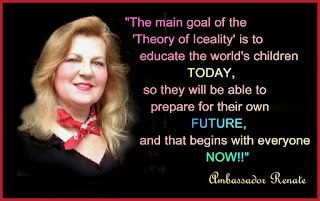 The Iceality Methodology is a goal-directed type of learning principle for the Worlds Children based on the assumption that ideas and experiences reinforce one another and can be linked to enhance the innate holistic learning process. It refers to the capability of people to improve their communities through their own instinctive creativeness by following the same type of positive hands on action inherent in the Theory of Iceality on Environmental Arts that was used to create the original model at Expo 2000 in Hanover, Germany. At Germany's World's Fair, EXPO 2000's 'Culture on the Move' segment, lead by American Cultural Ambassadors David and Renate Jakupca and the 140 Nation Assembly, the concept of a permanent universal symbol of renewal and peace on earth for all living inhabitants through the 'Theory of Iceality on Environmental Arts' was conceived. 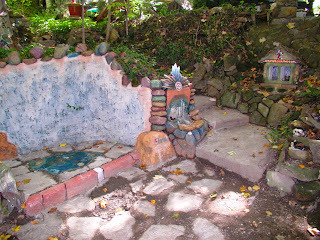 This Universal Symbol of Living Peace was the WCPM sculpture. This project was initiated in cooperation with the United Nations 2000 Culture of Peace Program and organized in support of the UN Decade of Peace and Non-Violence for the Children of the World and the United Nations Millennium Development Goals. The Iceality Methodology used to expand the WCPM globally has its origins in Nature itself, utilizing the basic fact that All Living things have an inherent need to grow and prosper. Like a parent plant grows and sprouts seeds to propagate and grow, The WCPM uses WCPM Peace Stones to grow and send their messages of Peace. 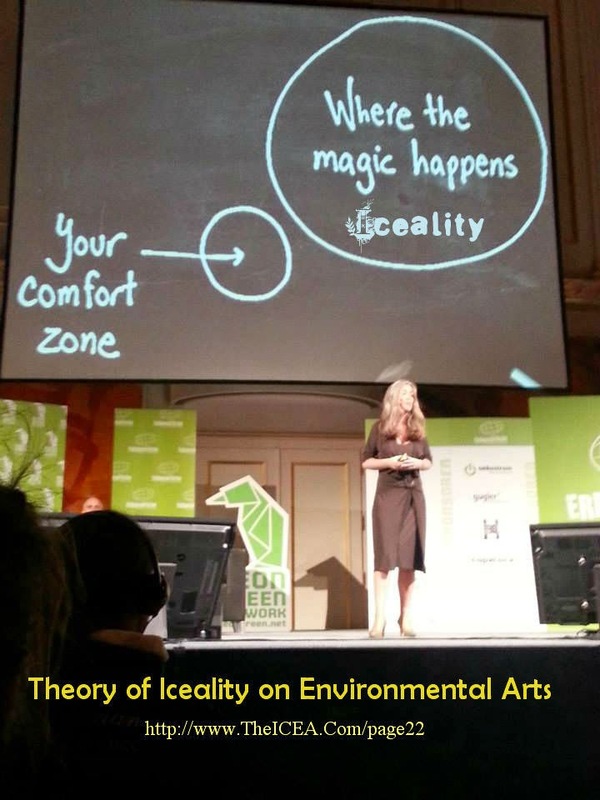 Their increased productivity in creativity is achieved through practice, self-perfection, and individual innovations from the original environmental artwork or idea. Research has proven that this repetitive type of learning process is based on the principle that related different ideas and experiences reinforce one another and can be linked together and to enhance the whole learning process. Through this collaborative creative process, individuals and communities are not simply beneficiaries of public art or recipients of treatment, but co-creators of the work as they learn new skills, gain knowledge among peers and community members, and play an active role in improving their physical community neighborhood. The Iceality Methodology is now the main process that organizations are utilizing to promote the United Nations Culture of Peace initiative. The concept of learning-by-doing has been incorporated by American Cultural Ambassadors David and Renate Jakupca in their design of endogenous growth of the WCPM to explain effects of innovation, technical and artistic growth of the Worlds Children Peace Monument. They use the concept to explain increasing returns to the embodied human capital working for Peace. 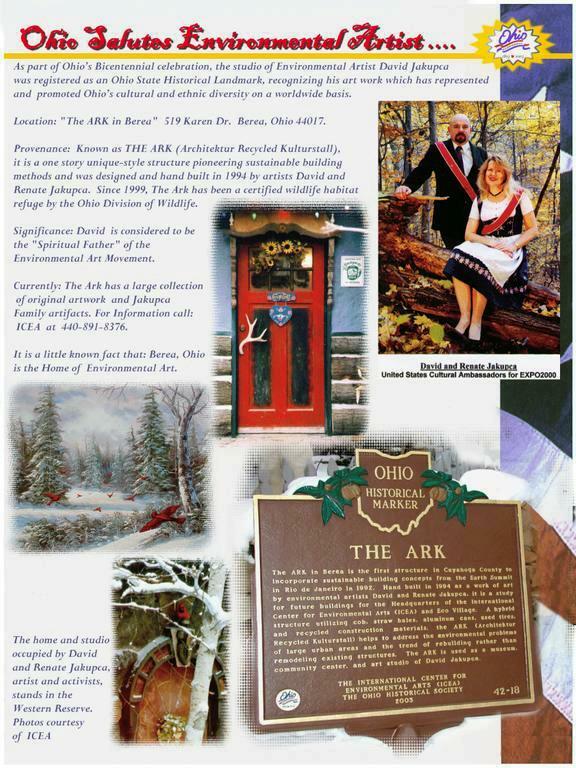 At the ARK in Berea, the Jakupca’s have shown that learning by doing plays a role in the evolution of neighborhoods to greater specialization in production. In both these cases, learning by doing and increases the returns that provide an engine for long run growth. It gives opportunities to those Family members who might not otherwise have them to succeed on their own. In conjunction with the learning by doing concept, a non-formal learning method is organized learning outside the formal classroom learning system. For example: Coming together with people with similar interests and exchanging viewpoints, in clubs or in (international) youth organizations and workshops…the group of teachers, civic leaders and interested community organizations work with the artist to set the goals of the Peace Stone Project that will engage the local youth in the project objectives. In some situations, the educational arrangement can use a combination of formal, informal, and non-formal learning methods. ICEA assisted the United Nations to recognize these different forms of learning. In some counties, children can get points that count in their formal learning systems for the work done in the more convenient informal learning curriculum. Additionally, as long as they can help to prepare, contribute, share and improve on this offered valuable new insight to peace, they may also be given time to assist in teaching and get actual work experience in organizing what they have learned in their own Worlds Children Peace youth workshops and training courses. This closes the significant gap between what children are told is important for their future career success and what business leaders actually want from the emerging workforce. Creative individuals are actually in demand, not just for arts careers, but for careers in business as well. So, even if the Worlds Children are not artistic prodigies, those hours spent practicing is not a total waste. 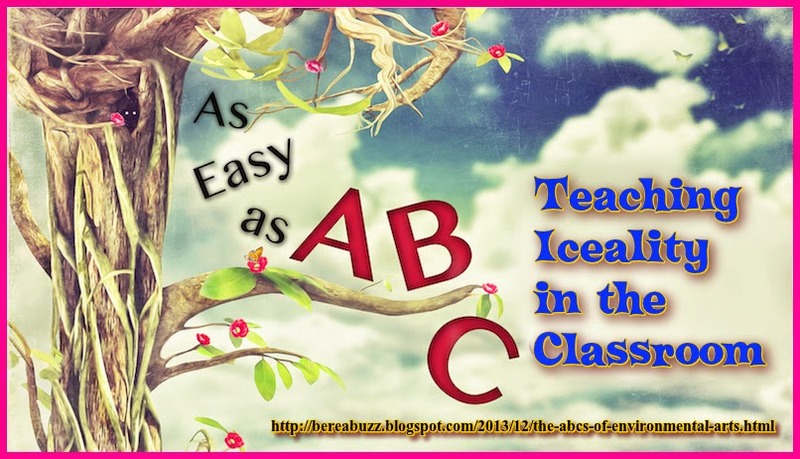 “This Theory of Iceality on Environmental Arts suggests the importance of a liberal education for today’s Worlds Children and prepares them for a healthy dynamic lifestyle for their tomorrow”. The fact is, that training in the Iceality Methodology in childhood affects their everyday life as older adults, and in our study this is especially true as the neural timing of the brain is the first to go in the aging adult,” said the Ambassador Renate. 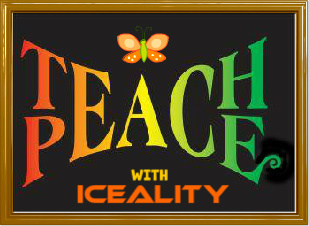 Utilizing the Theory of Iceality on Environmental Arts, the 'Iceality Methodology' was developed to promote the building of the Worlds Children Peace Monument (WCPM) and the Great American Peace Trail. Originally designed for MYSPACE, The 'Iceality Methodology' has been 'borrowed' as a tool for social change by virtually every social activist organization and group on Facebook is used by over 1 Billion people in a still growing audience. In a historic re-unification of the North Coast Community, as part of the Iceality Silver Revelation, North East Ohio Area has been 'branded' as the Home of the Environmental Art(s) Movement by the International Center for Environmental Arts (ICEA) as a 'Cultural Industry', to foster civic identity, cultivate jobs and tourism, and brand Ohio Environmental Arts and Culture District in the Bioregion. 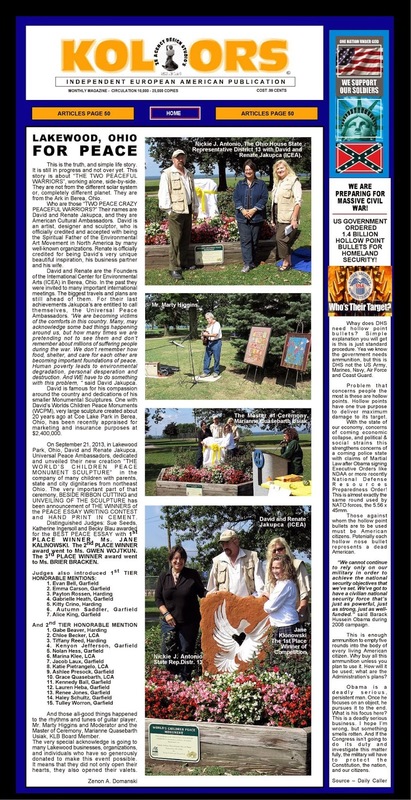 Environmental Artist Linda Zolten Wood, was inspired by St. Clair's 'Year of the..." statue competition/ auctions, and Northeast Shores Development Corporation free rain barrel distribution for 25 Collinwood residents per year. She and a jury of professional artists, selected from 25 area artists, who were called to create images inspired by lake sustainability, the North Coast and North Collinwood history. that focuses on empowering youth through public environmental art education. …places artists and art at the center of planning, execution and activity. …leverages the creative potential already present in a place. All places have creative potential just waiting to bubble up. Even while drawing on resources from beyond the community, leveraging local artistic and organizational talent and assets increases the value in a community and the commitment to it, while nurturing an enduring sense of place. …creates opportunities for people of all income levels and backgrounds to thrive in place. As its value increases, a place that is intentionally inclusive and connected is more likely to spur economic opportunity and allow people to succeed where they are. …supports economic diversity in the community, providing multiple points of entry and interaction for people of all incomes. The more economically integrated a community is, the more access to opportunity exists for all.…creates interesting places that capitalize on distinctiveness. A creative approach improves the aesthetics of a place, whether it is the look, feel, sound or even smell. The difference sets that place apart as more interesting than others. A place that expresses its distinctiveness and resists com-modification and sameness is more likely to have long-term appeal. …creates a place where people want to go and linger. Successful places attract people beyond those required to be there. People lingering is an investment of time in a place and is apt to lead to additional investments. …contributes to a mix of uses and people that makes places more diverse, more interesting and more active, thus making spontaneous interaction more likely. Intensifying and mixing activities creates the promise that visitors can stumble onto the fun, mingle with other people, or happen upon opportunity. …fosters connections among people and across cultures. The relationships built among diverse groups of people create safer, more open places that create more opportunity and foster a sense that everyone is welcome. …is always presenting itself to the public and encouraging pedestrian activity. Whether open or closed, a place that is a consistently interesting and active presence to the street promotes more pedestrian activity and creates the public perception that the place is safer and more animated. More pedestrians mean more prospective customers on the street to support more small businesses. …creates a place where business wants to be. As a place becomes more active, commerce is likely to respond, thus giving people even more reasons to be there. …convinces people that a place can have a different and better future. …supports economic diversity in the community, providing multiple points of entry and interaction for people of all incomes. The more economically integrated a community is, the more access to opportunity exists for all. …creates interesting places that capitalize on distinctiveness. A creative approach improves the aesthetics of a place, whether it is the look, feel, sound or even smell. The difference sets that place apart as more interesting than others. A place that expresses its distinctiveness and resists commodification and sameness is more likely to have long-term appeal. FAIR USE NOTICE: This website contains intellectual property and copyrighted material. Such information is made available for educational purposes, to advance understanding of human rights, democracy, scientific, enviromental, moral, ethical, and social justice issues, art & culture, etc. This constitutes a ‘fair use’ of any such private material as provided for in Title 17 U.S.C. section 107 of the US Copyright Law and the Digital Millennium Copyright Act of 1998 (DMCA) . 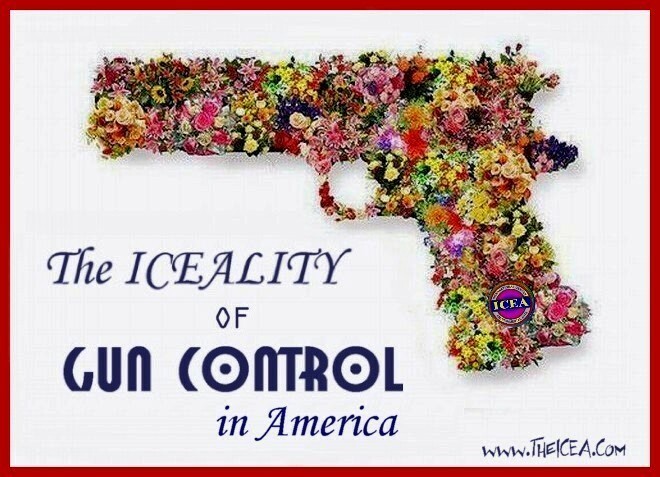 In accordance with Title 17 U.S.C. Section 107 and DMCA, the material on this site is distributed without profit to those who have an interest in receiving the included information for personal, research or educational purposes. If you wish to use material from this site for purposes that go beyond ‘fair use’, you must obtain written permission. Impressionism, Modernism, Abstract Art, Photo-Realists to name a few. Recently Pop Art debuted in the 1960’s and now at the beginning of the 21st Century, a socially aware artist with a vision is making a difference in art history. the "Father of the Environmental Art" movement. 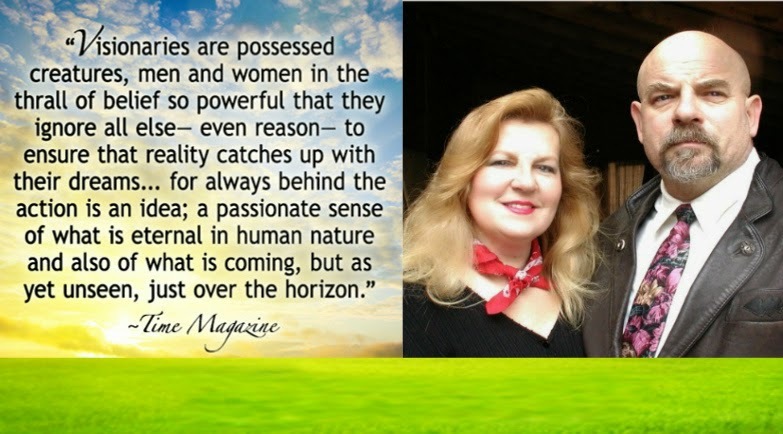 to environmental and humanitarian concerns facing Mankind in the 21st Century. for the Arts for reaching a global audience at Habitit II in Istanbul, Turkey. 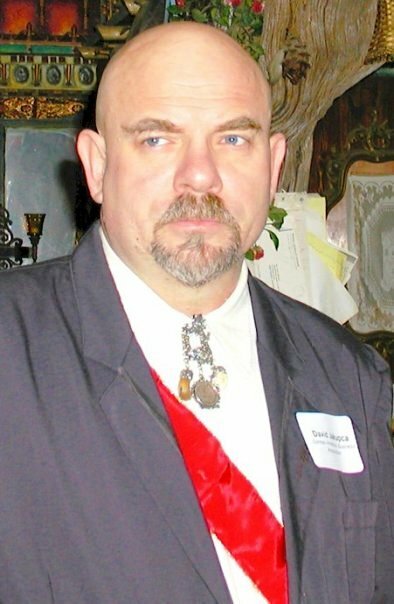 held in Hannover, Germany in the year 2000. - Reflections on Whiskey Island. so future generations can enjoy and learn from. 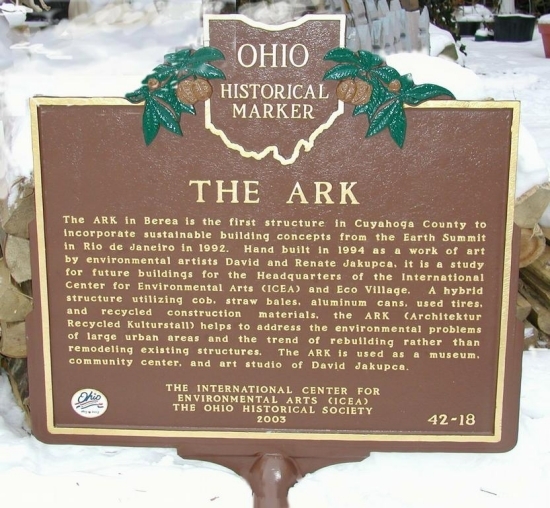 The ARK In Berea, Ohio was registered as on Official Historical Landmark. The Beginning of Greater Cleveland's Sustainable Movement can be traced to a rustic community fire pit at the ARK in Berea, Ohio. The beginning of North East Ohio's Sustainable Movement can be traced to a rustic community fire pit at the ARK in Berea, Ohio. Around the mid 1970s, a distinctly off-center collection of counter culture hippies, agrarians, artists, musicians, anarchists, philosophers, immigrants, nudists, students, writers, and some vegetarians started to assemble informally around a primitive campfire in the woods up the banks of the Rocky River in Berea, Ohio. 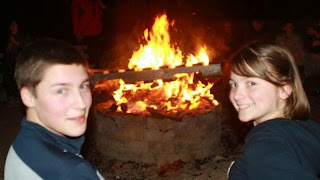 One of the main benefits of the campfire was transformation. Another was connection. 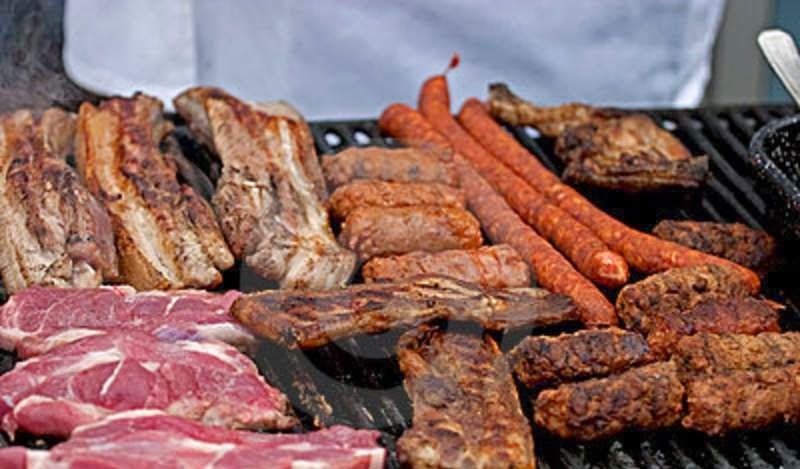 From ancient times, the simple act of gathering with others around a fire changes you…..and your way of thinking. There’s something about the Fire that connects us with the Universe around us in a way nothing else can. You bring your distractions, confusion and problems to the Fire, and somehow they burn away and become a little clearer and may even resolve of their own accord. Others may be able to assist you or you may be of help to others in clearing up everyday distractions. You stop pushing against life and begin, and like a small stone in the river below, to let life move you to the place where you belong..
Our camp fire was carved out of the side of the cliff where a little ledge had developed and formed with field stones found in the area. For years, it was used primarily as a camp fire and a part time cooking fire. It did not take long to figure out that the need to re-think this idea --- a campfire needs to be hot and blazing to work well while a cooking fire works better when there is no flame just hot coals. 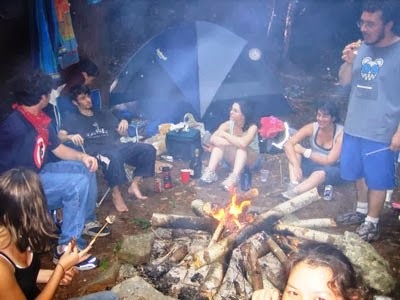 Also, in the wintertime, when the campfire was blazing, the people in front were roasting hot while the people behind them were freezing cold. Worse yet, if someone up front moved to much, they pushed the people behind them back until rear people would start to fall off the ledge. Sometimes usually when alcohol was involved they simply fell off by themselves. After a few years, a new safer fire pit site was built further up and the old one became primarily a cooking fire. 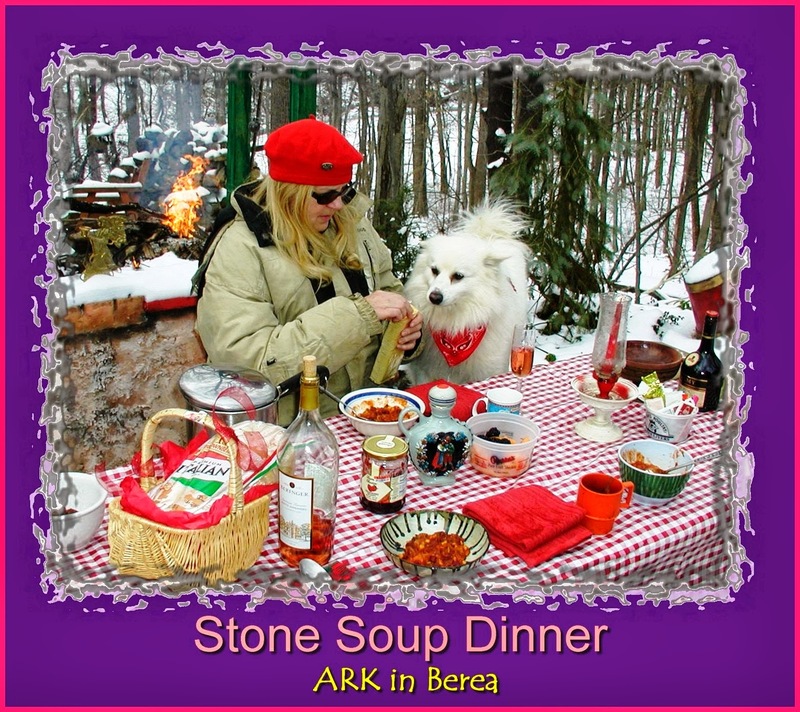 ‘Anything with a bone’ was usually on the roasting menu, and the weekly Stone Soup meals could include almost anything…even road kill. But over the years, the sides of the mud cliff kept on falling down and it became too dangerous to walk down the path to the Main Scenic Route MSR. So, cement steps were added, a retaining wall was built and now after 37 years, and in 2013 the ole’ campfire pit is being made into a cement puddle. A new wood burning stove will have to be built for cooking, maybe something along the lines that Alex Bevan uses. Canadians to Honor American Cultural Ambassadors David and Renate Jakupca with Canadian Peace Award. American Cultural Ambassadors David and Renate Jakupca will be awarded a Canadian Peace Award for the Windsor Peace Stone of the Worlds Children Peace Monument (WCPM)  during their visit to Windsor next month, according to a Canadian press release. 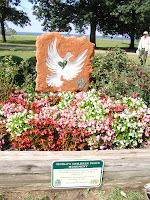 The Windsor Peace Stone is slated to be the cornerstone of the coast-to-coast 'Trans Canadian Peace Trail”. 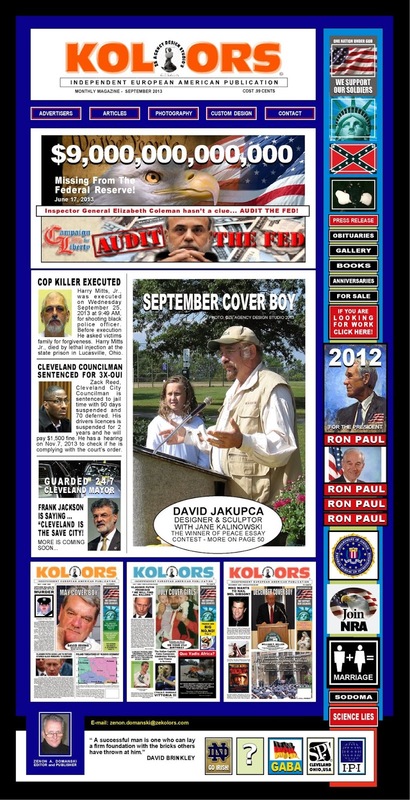 The Jakupca's will be the first Americans to receive the honor, which was announced by a coalition of Canadian peace organizations on Monday, August 12, 2013. The Canadian Award is a CRISTAL d'ALBRET PAX Peace Plate by GILBERT POILLERAT. The 9" Peace plate is very heavy crystal glass with beautiful molded detailing. 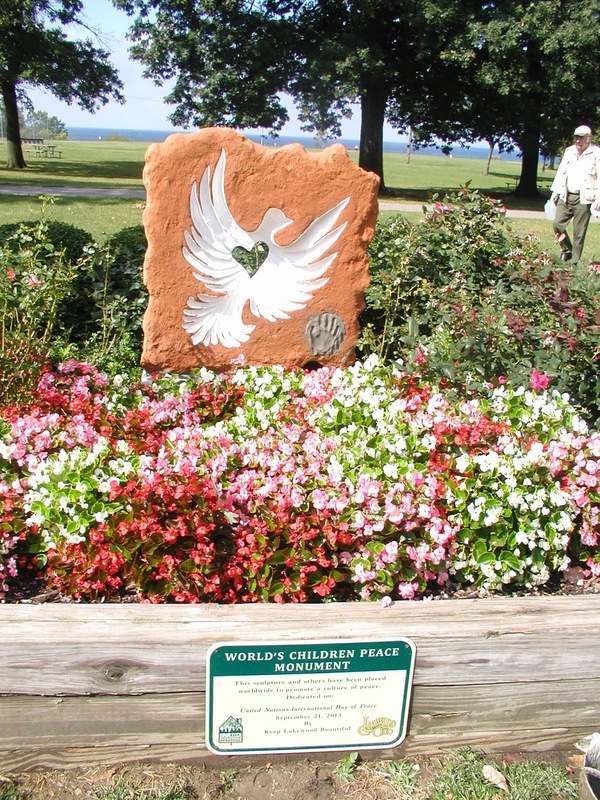 It's of a dove, holding an olive branch surrounded by children and is a fitting testament to the mission of the Worlds Children Peace Monument (WCPM). 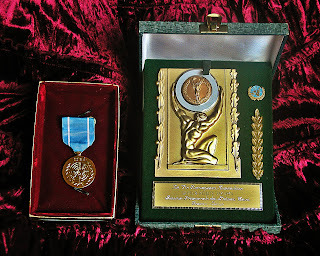 It comes in a cloth lined presentation box with Plaque of Remembrance. "David and Renate Jakupca are true friends of the people of Canada, and they have been since the beginning of the formation of The International Center for Environmental Arts in 1987,” Sharon Demming, spokeswoman of the Peace Coalition, stated in the release. 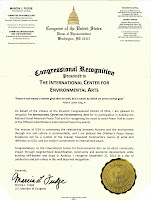 Canadian Rick Coranado of Great lakes United and the Clean Water Alliance presented ICEA with an environmental award in 1992 for the exhibit, 'Endangered Spaces' that first addressed the concerns about the dangers of over development of the Great Lakes shoreline. 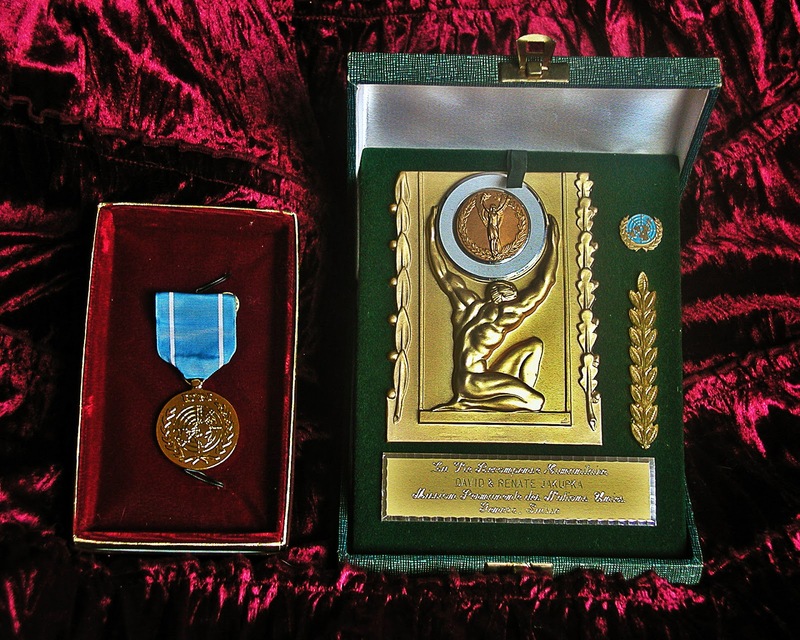 The award also follows Jakupca's receiving the prestigious 'Freedom Award' by the American Nationalities Movement Organization in 2012. The Jakupca's will receive the award as part of the dedication of the Windsor Peace Stone located for the 2013 International Children's Games in Windsor-Essex, located at the new 77 million Dollar Windsor Aquatic Center. Use this directory to find a peace group in your area.